This paper originally appeared in All Wave Radio magazine, February 1937. Pictures referenced in the article are shown under the heading "W1HRX Station in the late 30's" elsewhere on this website. Mr. Lynch's article is a great description of the James Millen radio shack and surrounding grounds that facilitated his most active period of amateur radio operations. In order that you may have a mental picture of the owner and operator of the station we are about to describe, it may be desireable to tell you something about the gentleman himself. His contributions to the radio art are quite generally recognized in that field but his personal characteristics are known to only a limited few with whom he comes in contact in the course of business or with whom he converses on the air. Of course, for the past three years, the National Company's rather intimate conversational page, written by Mr. Millen and published in QST, has given most of us, in the amateur game, some inkling of his ability and personality, to say nothing of some very valuable engineering facts. "Jim," as he is generally known by the radio fraternity is a very modest, unassuming sort of gentleman who hates hustle and bustle and noise in a profound fashion. The "M.E." which follows his name, is a degree which he received from the Steven's Institute of Technology, at Hoboken, New Jersey. He was most fortunate in having , amoung his instructors at Steven's the now famous Professor Hazeltine, of neutrodyne fame, as well as Professor Vreeland, whose valuable contributions in connection with band-pass tuning have done so much for high-fidelity radio reception. At the time, Jim lived with his mother at Elmhurst, Long Island. The trek from Elmhurst to Hoboken was in those days, something which would not be envied by the present-day college man. While it is generally considered that getting through Steven's is no cinch, Millen found time to prepare magazine articles which started appearing in Radio Broadcast . In addition, to his technical pursuits, he found sufficient time weekends to build for himself, and with very little help, a bungalow at High Hill Beach, which is now a part of the famous Jones' Beach State Park. All of the wood for the bungalow had to be transported by boat from the mainland to the little dock at High Hill Beach, and from there it was toted piece-meal to the bungalow's location, a little over a mile away. After the bingalow was completed, battery-operated radio equipment was installed and some remarkable results were obtained with extremely long antennas stretched along the beach. However, that is an entirely different story and our principal point in mentioning it is that the owner of the "Paradise" we are about to describe is a person who has a certain amount of push, and who understands that only by having such seclusion is it possible to secure the kind of radio results that all of us would like to obtain. The hilltop on which Mr. Millen's present station is located just north of Middleton, Massachusetts. It is considerable distance from either homes and one of the highest spots in the Boston area. The hilltop is reached by dirt roads which branch off the main thoroughfare passing a half mile in either direction from the top of the hill. The dirt roads have the character of mountain trails and would be ideal for Rocky Mountain goats. Among other things, the property includes a large sized pond, a very pretty brook and a pine grove, which puts one in mind of the redwood tree area in the far west. The main house is a white colonial, located on a small plateau, near the top of the hill. It was built 200 years ago and some of the boards in the floors and the roof are thirty inches wide. It has been modernized by Mr. Millen and his mother to the extent of incorporating a most up-to-date bathroom and kitchen. This modernization has been done so skillfully that the New England colonial atmosphere of the dwelling has been preserved. On a clear day, the Customs House, at Boston, some twenty-eight miles away, may be seen from the front porch. The Porch, too, provides a view of the excellent swimming pool, some hundred feet down the slope. The bungalow, shown in the general view of the hilltop, is the radio station itself, and is approximately one-hundred yards away from the main house. The house itself is located to the left of the bungalow and the swimming pool is located quite close to the grape arbor which appears in the lower left-hand corner of the general picture. There is an extension on the side of the bungalow, not in view in the picture, which has recently been added and which serves as a bedroom, with twin beds, for the accommodation of visiting radio amateurs who insist on staying up all hours to work the rig. The provision of this bedroom in the bungalow makes it unnecessary for the visiting brass-pounders and voice-throwers to wake up the remainder of the household when they do decide to go to bed, and it has the distinct advantage of enabling them to sleep late in the morning, without being aroused by those who would care to be about in the main house. The mast sticking up from the chimney supports a short antenna which is used for local reception and particularly for operation on five meters. The large frame-work tower in the center of the picture and the cumbersome contraption which it supports, reminds one of the rotary aerial swings that one finds at seaside resorts and at county fairs. Actually, it is a 20-meter, four element beam antenna. Signals from this beam have been heard in all parts of the world. The original plan for this antenna called for a motor, located at the top of the tower, to be used for rotating the beam. 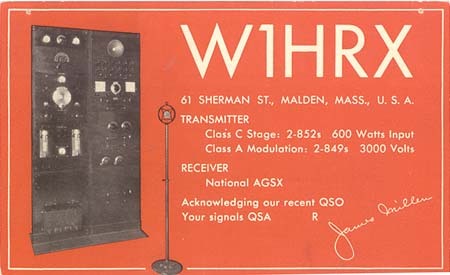 This refinement was never completed, however, as the particular stations with which W1HRX maintains regular schedules can all be worked from the same orientation of the array. Details concerning the manner in which the beam antenna has been made are discernable in the large, close-up picture of the beam itself. (This close up doesn't appear on this website, but the array is visable in the bungalow picture - JMS) Two of the elements are feed in phase from a 600-ohm line and there are two parasitic reflectors behind the radiators. As is true with every amateur station, each of the important components here is surrounded by an interesting story. Take, for instance, the five meter, eight-element beam array shown supported by the frame-work at the left of the picture. Before this workmanlike unit appeared, all sorts of makeshift arrangements, of the same general dimensions, were tried and found to be practically useless. The headquarters staff of QST wanted to carry on some experimental work, in connection with long-distance transmission on five meters. Millen's hilltop is about 128 miles from Hartford and it was thought that this distance would be ideal for the experiments. Accordingly, after the preliminary aerial had been abandoned, the unit shown in the picture was built. The results obtained with this antenna are now well known to nearly every amateur, and consistent day and night transmissions between this beam and a similar unit installed at Hartford were carried on for over a year. While W1HRX now appears to be close to ideal it must not be thought that this station has come into being without any of the aggravating circumstances which the rest of us encounter. A very severe headache was caused during the construction of the lattice work mast which appears prominently in the general view of the station. The four corner supports are made of 4 by 4 pine joists in a single length. It was found that units of this size, 34 feet long, could be obtained at a local lumber yard. Operating on the basis of this length, complete drawings for the entire tower were made. Later, a piece of lumber, 38 feet long, and measuring 8 by 8, was located. At no small cost, it was cut up into four pieces, 4 by 4 and 38 feet long. Millen was perfectly willing to pay the premium for the additional four feet of height. On his arrival to the "farm" that evening you can imagine his distress when he found four pieces of 4 by 4, four feet long, lying on the barn floor. He was advised that the carpenter had cut them off the long length so that the tower would coincide with the drawings which had been made. Even after this catastrophe, troubles continued to hover about. It was difficult to secure a supporting member for the vertical radiator which would have the dual characteristics of strength and lightness. Ultimately, after a two weeks wait, four 30 foot bamboo poles were secured in New York, and it must be said that 30-foot bamboo poles are not especially easy to find. Nor is it easy to ship then without having them broken, after they have been found. Two thoughts guided the securing of the "Hilltop" which is now so well known to most amateurs as Radio Station W1HRX. One was Millen's desire to secure a summer retreat, where his friends could be suitably entertained and where a reasonable degree of privacy could be had. The second and perhaps the more important reason was that he is a firm believer in the policy of giving everything a very thorough trial under severely practical conditions, and he wanted a place where new ideas and new equipment could be put through their paces unhurriedly. Nearly all of the equipment carried in the right-hand relay rack, shown in the corner of the operating room, is useful for receiving only. Certain tricks in this layout, however, are not immediately apparent. The power supply for the exciters is located at the base of the relay rack, in such a position that the operator can throw the toggle switch on and off with his foot without reaching down. Provision of a wooden shelf, directly beneath the receiver, eliminates the necessity for an extra table or a desk for operating purposes. It will be observed that the log, key and microphone are right at the operator's elbow. The space between this shelf and the top of the power supply was formerly occupied by nothing but blank panels. By the simple expedient of employing a few metal shelves which are attached directly to the relay rack, which was formerly dead space, makes all of the necessary equipment immediately available and at the same time provides a place for ash trays, tall glasses, etc., where they'll not be easily upset. The power lines do not reach this station. In order to energize the rather powerful equipment which is used here, it is therefore necessary to generate power on the hilltop. Several power plants are available. A "Windcharger" was mounted on the peak of the barn roof about two years ago and it has been doing active duty ever since. It takes care of some of the emergency lighting in the main house by keeping a bank of storage batteries, located in the barn, fully charged at all times. These storage batteries are also used for starting the gasoline engine which drives the intermediate power supply and which is located a considerable distance away from the house. This gas engine drives an alternator which is used for light and for operation of one of the lower powered transmitters. It is also employed in connection with a pump, used to draw water from a spring and pump in into a huge tank located directly behind the barn. In addition to the transmitter shown in one of the accompanying pictures, another and very much more powerful unit is located in another corner of the room and is link-coupled to the transmitter shown here. With this higher powered final amplifier it is possible for the station to be run to the full legal limit. The installation of the gasoline-driven generator, which is located just outside the windows in the operating room, was a task of no mean proportions, in spite of the fact that Millen had the very valuable assistance of Fred Davis, who is the General manager of the Rumford Press, among whose tasks are the printing and distriburtion of the Reader's Digest. The very important work of assisting in attaching the fireproof covering for the gas engine into the operating room, were delegated to Davis and your present reporter.